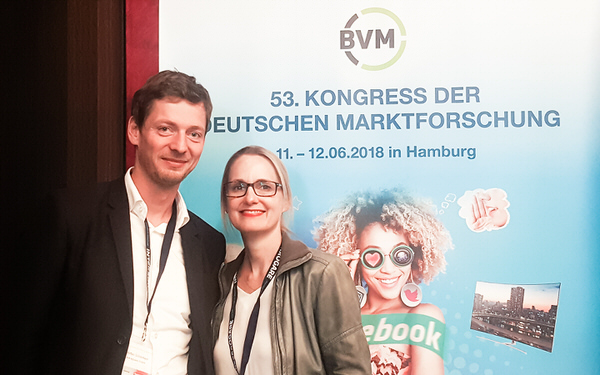 We are delighted that Clarissa Moughrabi (Axel Springer SE) and Stefan Schönherr (Unit Lead Brand & Media Experience, eye square) have been nominated for the Ulrike Schöneberg Award 2018 (Best Paper). Clarissa and Stefan presented their topic “Emotional potential and contact qualities of media genres” at the 53. Kongress der Deutschen Marktforschung(11.-12. June) in Hamburg. The genre-neutral study examines the advertising campaigns of print, TV and online channels with regard to their media-specific processing and impact patterns. The study shows that emotions have a special effect on us. We are more receptive towards advertising and more willing to follow recommendations when we are in a positive state-of-mind. They applied a combination of equipment-based methods such as eye tracking, facial expression measurement and skin conductance (EDA) to measure reception attitudes- as well as a reaction time measurement to capture the implicit brand image. Ultimately, the Ulrike Schöneberg Award went to Dr. Peter Ludwig and Nicola Niesl from Kantar TNS. We congratulate the winners and look forward to the next challenge!